With AmeriGlide's vertical platform lifts, there's no need to limit your lifestyle any longer. 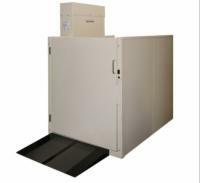 All our vertical platform lifts offer smooth, quiet performance and are lightweight and dependable. 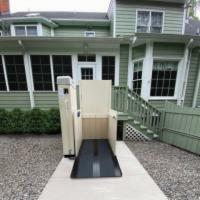 Whether you need a wheelchair lift for residential use, a commercial application, or if portability is your primary concern, we have a platform lift for you. Contact us and one of our vertical platform lift experts will help you determine which platform lift and accessories are correct for your application. A 750 lb. weight capacity makes this lift strong, with an optional 1000 lb. weight capacity. Price shown for 53" model. Upgrades to 77", 101", 125", 149", and 171" heights are available. A 750 lb. weight capacity makes this lift strong. Basic commercial package included. 750 lb. weight capacity and able to move from one location to another. The Toe Guard has a 750 lb. capacity and eliminates the need to build a hoistway for the lower landing. Belt driven ball screw/90 VDC 1/3 hp motor with brake. The AmeriGlide EPL has a 750 lb. 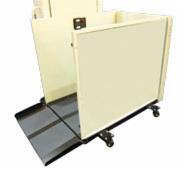 capacity and comes with steel or optional acrylic panels that make installation even easier.